Henrietta always knew that she was destined to be a companion to her cousin, Lady Catherine. Stories differed about how Henrietta arrived in the household, but it was always clear that – barring some unforeseen and unlikely marriage – she would live out her days as the poor relation of the family. The two girls grew up together in the same household, with Catherine clearly the favorite of family and servants alike. Henrietta learned at an early age that Catherine’s affections were fleeting and most definitely conditional. Upon Catherine’s London society debut in 1787, Henrietta is there as her almost-invisible chaperone. 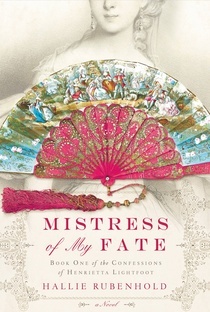 Catherine has many suitors, but turns them all away until she meets Baron Allenham. Even with her sheltered upbringing, Henrietta can see that Allenham is handsome and charming; he even makes sure to speak with her. Speaking with him, she realizes that he’s also quite intelligent. Her feelings for him continue to grow despite his clear public dedication to her cousin. A single dance sets off a chain of events that radically changes Henrietta’s entire life, leading her from her childhood home to a life as a courtesan and celebrated woman in London. The author is a historian of British society in the eighteenth century, and it shows. Her depiction of the very formalized courtship rituals, the household hierarchy, and the various strata of society are all expertly drawn. The difference between a genteel seventeen-year-old girl in the 1787 and the average seventeen-year-old today make the people in this novel seem almost alien. But the author writes in such a way as to make everything completely accessible and understandable. The book begins with Henrietta frantically running away from her uncle’s home; an act that will forever ruin her reputation, no matter what the outcome. The story is told by Henrietta herself, looking back after a period of many years. When the events begin to get a bit too sticky-sweet, as they will with a teenager in love – the present-day Henrietta interrupts her own narrative to wonder at the fact that she could ever have been so naïve. In doing so, it keeps the story from being bogged down in sentiment. It’s clear from the outset that Henrietta will become notorious, and has her public detractors. In the fashion of the time, she addresses them and the reader, in her narrative. This is the best kind of historical fiction: a story that makes readers feel that we’ve truly witnessed the past, good and bad. I never wanted to put it down, and was disappointed when it ended. It’s good to know that there’s more to come since this is the first of a trilogy.